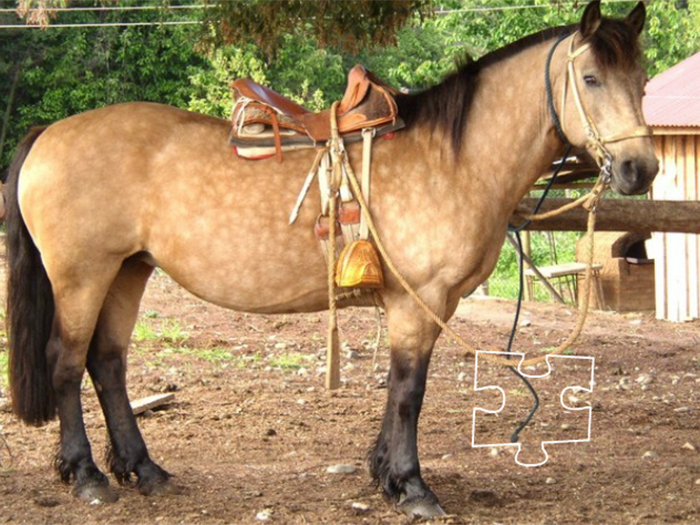 The Chilean Corralerio is a horse breed developed in Chile. The Spanish horses were brought to the Americas in 1541 by the Spanish conqueror Pedro de Valdivia. Later in 1557 new 42 horses of the caste of the Guzmanes and Valenzuelas, arrived and the crossbreed between the Spanish horses and two abovementioned bloodlines resulted with the beginning of the Chilean horse. So we can conclude that the Chilean Corralero horse like many other American breeds, has originated from the Spanish stock that was brought in the 16th century. The pure Chilean breed appeared by the beginning of the 19th century and the Chilean Corralero by the end of the same century. However, they weren`t developed well until 1913 when breeders began with selective breeding.
. The head of the Chilean Corralero horse is flat, medium in length and it has a straight or slightly convex profile. The eyes are expressive and with the nasal aperture are going behind the facial profile the ears are small, mobile and separated and the muzzle is fine and small. The neck is medium in length and wide at the base, the chest is broad and deep and the ribs are arched. They have short and strong back rounded hindquarters lean, strong and well-muscled legs, but short and mane and tail being abundant, wavy and thick. Initially, the breed was used for agriculture purposes as a workhorse. is one of our selected horse breeds games which can be played for free at horse-games.org. It has been played 4368 times and has been rated from administrators of horse-games.org with 4.65 stars out of 5. They were also used in wars used by the Spanish conquerors, as castle worker, and for transportation. They have an incredible talent for a stock cow-horse event that is physically and mentally very demanding. Today they are used as cattle horse and rodeo mounts, showing their cow work instincts. In the countryside of Chile, the rodeo differs from the rodeo found in North America. Its a typical game of chasing cattle by a team of two riders and two horses and in the modern event they can show all of their abilities. It is incredible to see a horse of 370 kg to stop and press a bull of 500 kg. This traditional sport began in the 16th century and was declared a national sport in 1962. After all, the name of the breed is connected with the purpose that is bred for in centuries- rodeo horses Corralitos.